When practicing Kundalini Yoga it is very common to chant a mantra during your yoga practice (Kriya) and many of the Kundalini Yoga meditations involve chanting a mantra. A mantra is a sound, not just any sound, but sacred sounds, syllables that carry a certain vibration which affect our mind and thus our mood, the way we feel. Feelings and emotions always are a reaction to a thought, even if you are not aware of the thought itself, and just like sound waves, these thought waves vibrate at a certain frequency. Chanting a mantra allows you to consciously shift the frequency in which you vibrate. It is a very powerful tool to help you break out of negativity (lower vibration) and bring you back into a more harmonious, open and loving vibe. 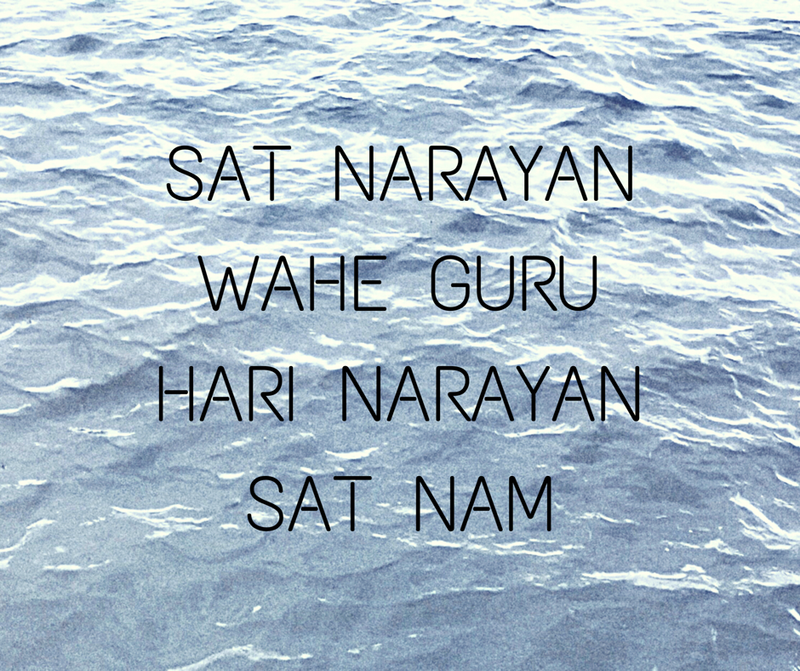 In one of his teachings Yogi Bhajan shared a mantra that is especially useful to help you to feel more inner peace through the powerful cleansing of the subconscious, the Chotai Pad mantra, also known as Sat Narayan. 3) Other meanings or translations of ‘Narayan’ are: Resting place for all living entities or the One who rests on water. This mantra helps you to relax and allow yourself to surrender into a state of non-resistance, going with the flow. The sound Narayan is related to the water element and represents Vishnu, the God of the Water. Water cleanses you, it flows and it can carry you if you allow yourself to float, to relax. As babies in our mothers womb, water was our home, where we felt safe and protected. Chanting this mantra brings you to this primal state of inner peace and once we feel it, we vibrate it and then we project it outward, bringing peace into the world. You vibrate the divine essence. Sat Narayan brings you beyond the phenomenal world, the 3 dimensional world you can see with your physical eyes, it allows you to sense the infinite, it opens you up for a more subtle, peaceful experience of life as it sows the seeds of peace and patience inside of you, bringing you to the realization that peace cannot be created, rather it is the most pure essence of your True Self, Sat Nam. Dive deeper into the experience of chanting this mantra and do this mantra meditation on our Practice Page. It helps you to relax and allows yourself to surrender into a state of non-resistance, to go with the flow. Chanting this mantra brings you to this primal state of inner peace and once we feel it, we vibrate it and then we project it outward, bringing peace into the world. Do the Meditation for Inner Peace on our website.